Whether you’re a parent or a child care provider in Anaheim, California, you must always be on the lookout for interesting things to use to enhance your little one’s learning experience. Gladly enough, these precious ones are at this crucial stage in their lives when learning happens quickly. For this reason, you can always utilize anything to get them to understand letters, numbers, and colors. These are the abilities of a child to hold on to small things. Their fingers are not just little but also not strong enough to grip on things. When they play with building blocks, however, they can practice and exercise their fingers unto holding these small blocks. As a result, their fine motor skills improve, which can be beneficial when they will hold pencils for writing later on. Your child will use both their hands and eyes in stacking up these blocks one over the other. This activity may look simple, but it’s actually improving your little one’s ability to coordinate what their eyes are seeing to where their hands are moving. They have to make a careful decision on where to put the blocks so that these will not topple down easily. 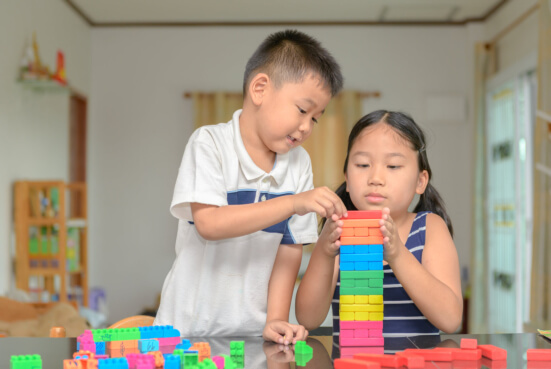 With constant block-building, your child will eventually realize that there are certain strategies to do so that the blocks will not lean in a certain way, thus, preventing its fall. This realization comes from a cognitive reasoning that has been honed by the constant exposure to doing building blocks. Numerical and geometric figures are familiar sights in preschools that also provide child care services in Anaheim, California. With building blocks, the child is trained to count, feel a shape, and understand how one corner fits another. These are mathematical skills that can help them later in their academic years. With constant exposure to playing building blocks, children can eventually understand that they can create different types of spaces. Some spaces are narrow while others are large enough to put other blocks in. This spatial awareness enables them to navigate through classroom spaces and stay in safe areas. Hence, building blocks are not just toys that your preschooler can play with. They are also items that can teach lessons which you can utilize, especially if you’re intent in enhancing their learning capacity. As a provider of child assistance program in California, our staff team at Happy Hearts Preschool and Childcare is ready to welcome your child into our folds to support their learning endeavors. Do encourage your fellow parents about how building blocks can help their children! This entry was posted in Building Blocks and tagged Child’s Learning Growth, Cognitive Ability, Educational Items, Math Skills. Bookmark the permalink.